Gauges are available in 3 3/8” 5 gauge sets. Quad sets are available as 3 3/8” and 5”. Tachometers are sold separately in both a 5” & 3 3/8” size and we also carry 2 1/16” 12 Volt Quartz Clocks & 2 1/16” 5 & 6 Gauge Sets. 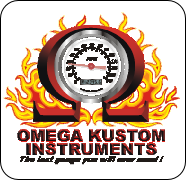 _All of Omega Kustom’s Instruments have the finest movements available today and the latest lighting technology. Polished Stainless Steel bezels and real glass lens. They are available in three colors: Black Top Series, Kool White Series, and Timeless Tan Series. Cable driven (mechanical) speedometers have trip odometers, electric programmable speedometers have many functions including trip odometer,hour meter, over speed indicator. They are compatible with all known computers including LS1, LT1. and all Fords.All of Omega Kustom’s Instruments have the finest movements available today and the latest lighting technology. Polished Stainless Steel bezels and real glass lens. They are available in three colors: Black Top Series, Kool White Series, and Timeless Tan Series. Kool White Series Programmable Speedometer pictured. Timeless Tan Series with Black needles Tachometer pictured. Timeless Tan Series with Red Needles 2N1Speedometer/Tachometer combo gauge pictured.